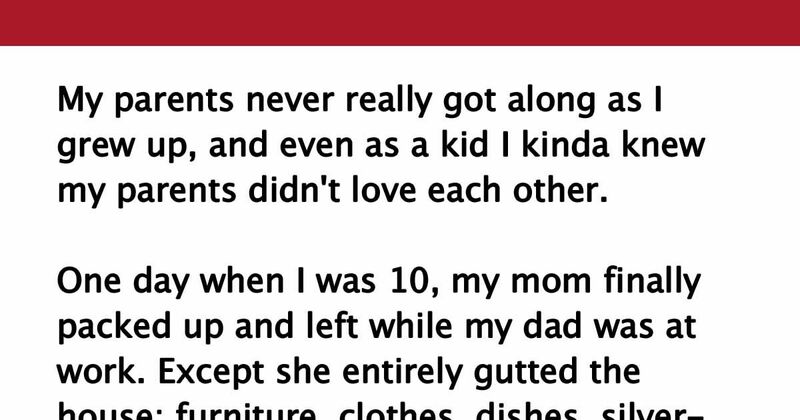 My parents never really got along as I grew up, and even as a kid I kinda knew my parents didn't love each other. One day when I was 10, my mom finally packed up and left while my dad was at work. Except she entirely gutted the house; furniture, clothes, dishes, silverware, electronics, everything, packed into the back of a U-Haul and drove off and left me. I remember crying and screaming and clinging onto to her leg to not go, or at least take me with her. Anyway, I called my dad and told him what happened. He couldn't leave work early, but said he'd be home as soon as possible and to lock all the doors and windows and stay safe inside. I have no idea why, but I remembered these panini-type sandwiches my dad made all the time for me, and decided to make one for him. I think I just needed something to do. So I made him a sandwich, put it on one of the paper plates I found, as my mom had taken all the other dishes, and sat on the front stoop and waited for him. I kinda just stared at it, and ended up sitting out there for about four hours. When my dad got home, he was shocked to see the house gutted. I kinda just held up the plate to him and said "I made this for you," and he took it, sat next to me, and ate it with me. I could tell he was trying his hardest not to cry in front of me, so I pretended not to notice him tearing up. 5 years later, my dad still talks about that day. He talks about how my small gesture was the silver lining on one of the worst days of his life. He says I saved his life. Such a moving story. Make sure to SHARE this with all your loved ones.